Oh, it is so lovely to be home in Oz! 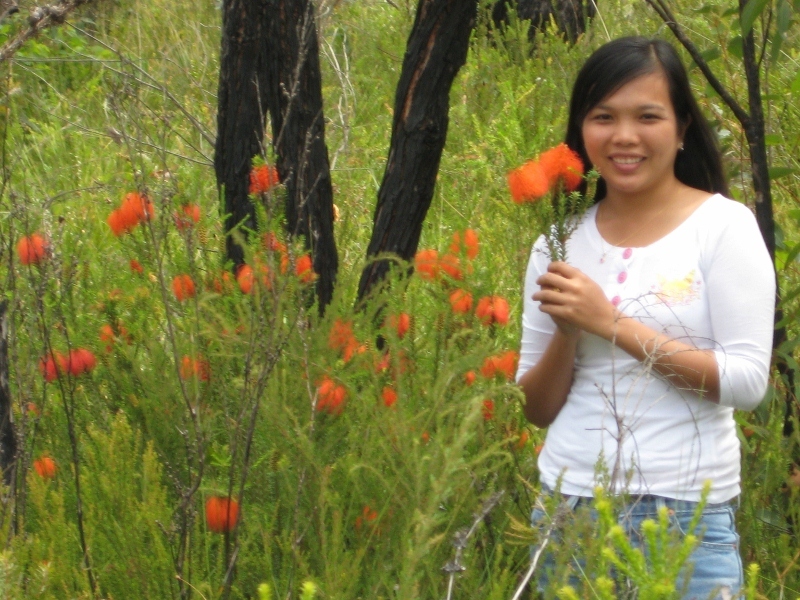 Thailand is a wonderful place to which I have a close affection, but Perth ... clear skies, clean air, little traffic and this is "Home"! I wish I could say I am rested, not so - all an adventure each time I visit. 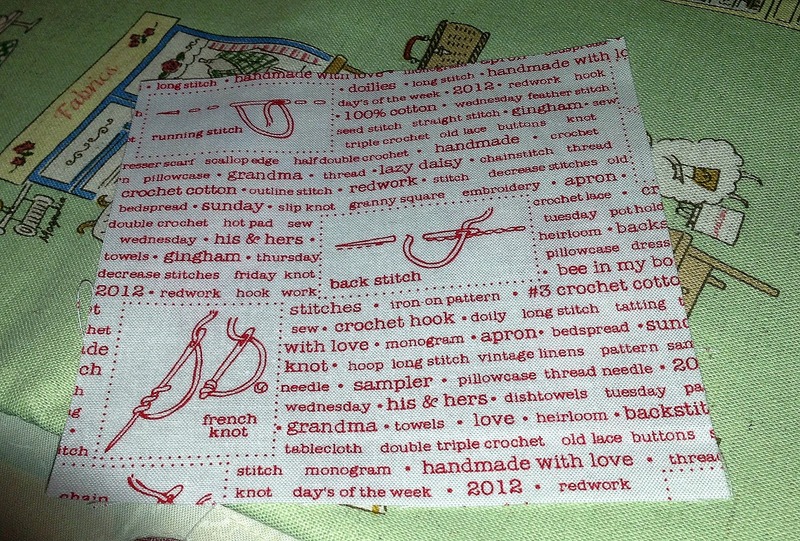 So very little stitching done in the past three weeks and I really must do just a little today or Chookyblue will excommunicate me from her Stitch-Along! I have lots to talk about and maybe I will break it up into small segments in days to come. 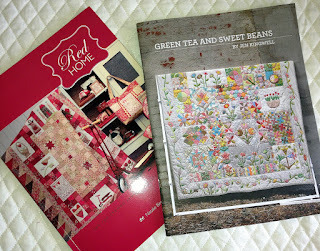 There was a few lovely parcels wating for me that the mailman had brought. Great excitement to receive my new book Softies Only a Mother Could Love. 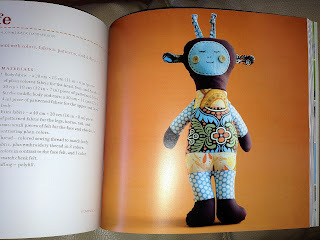 I love this little guy Hector Giraffe by our very own sweet Kate of Two Little Banshees - already I intend doing one for me and one for our precious wee one due 24 June - oh, I have itchy fingers! 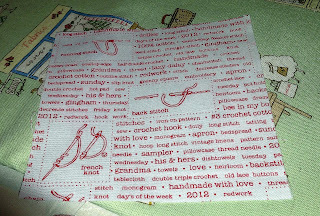 Tomorrow is another day - lots to do today - 'til then, Happy Stitching! 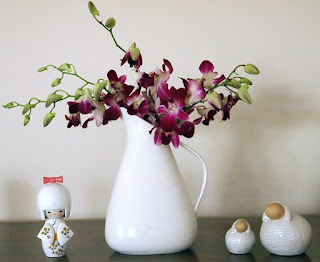 The countdown is on, still lots to do - I'm slipping in this little Post before I go. 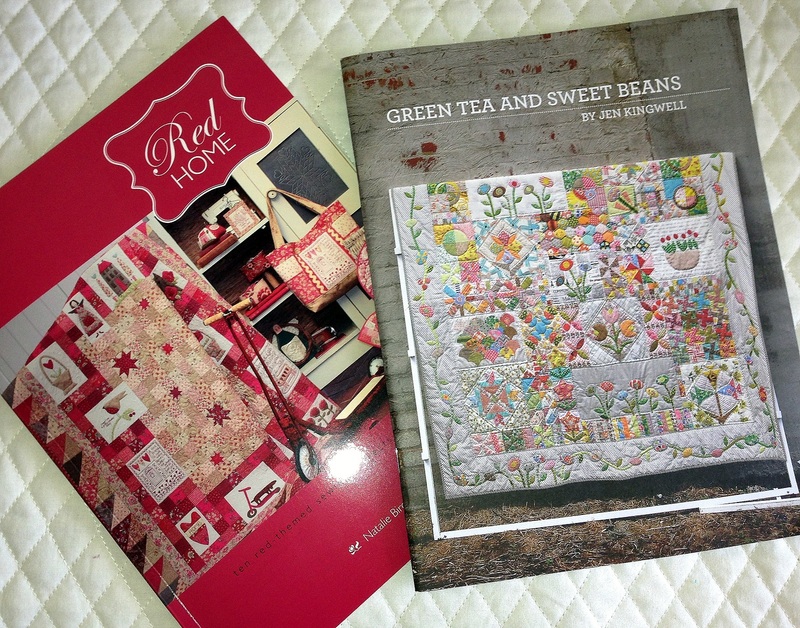 Two delightful little books have arrived during the week - Red Home for Chookyblue's Stitchalong and GT&SB -the latest mentioned, I just love this quilt and started many years ago and now that there is so much popularity I've decided to have another go! 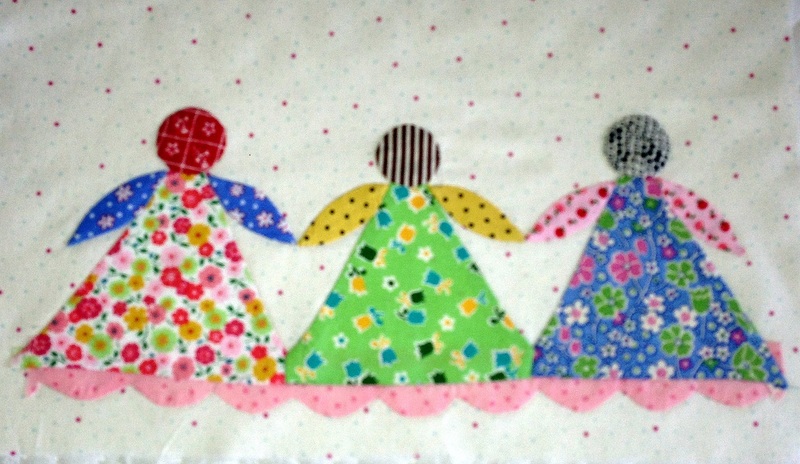 The above pattern is an original of mine and the one below with the little dollies, well I figured I would find a spot for it in the quilt. I love whimsy, so there could be a few additions and subtractions. Dear Mother Harriet - I will take her to a respite centre this afternoon - somehow I think it will work out okay. 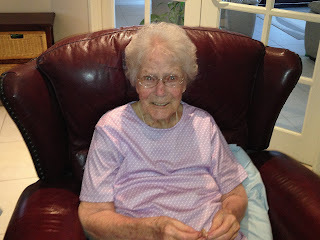 My goodness, I look at her all the time and don't often notice the sparkle in the beautiful blue eyes she has had all her life and that's for 94 years! 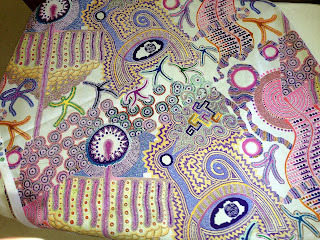 Pretty new fabric - I love it and don't know why? 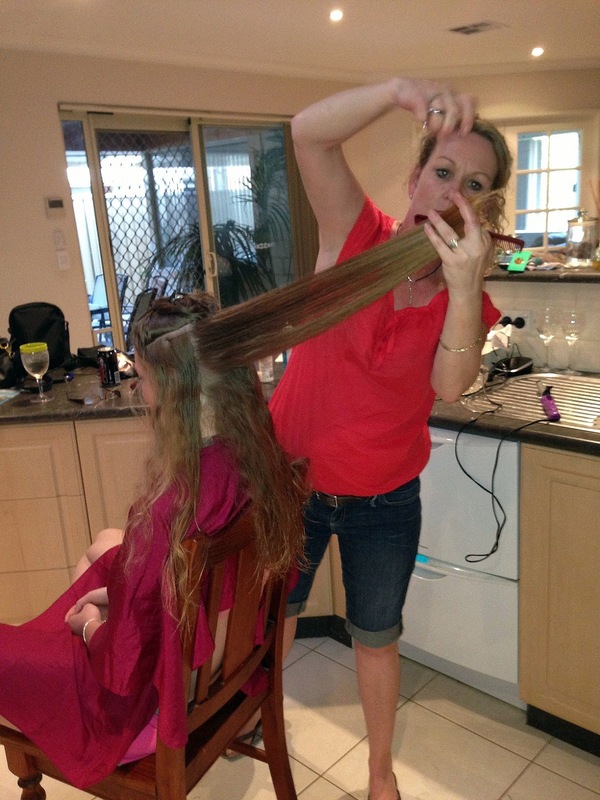 From stitching to family - my beautiful daughter, Angela cutting beautiful grandaughter Ayesha's hair - how long is that? The most beautiful head of hair I have ever seen, wash and wear and yes, Angela is a hairdresser. God bless and stay safe, I'm off to Thailand on an early flight tomorrow! 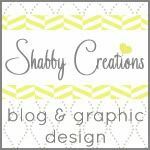 There is just so much happening in life and this Post is sooo jumbled, but stay with me, please! I am deliberately using my new iPhone5 for pics (very bad ones, too) and U2 beautifully blasting Beauty Queen from David's room! Hard to do, but let's skip this one for a wee moment! 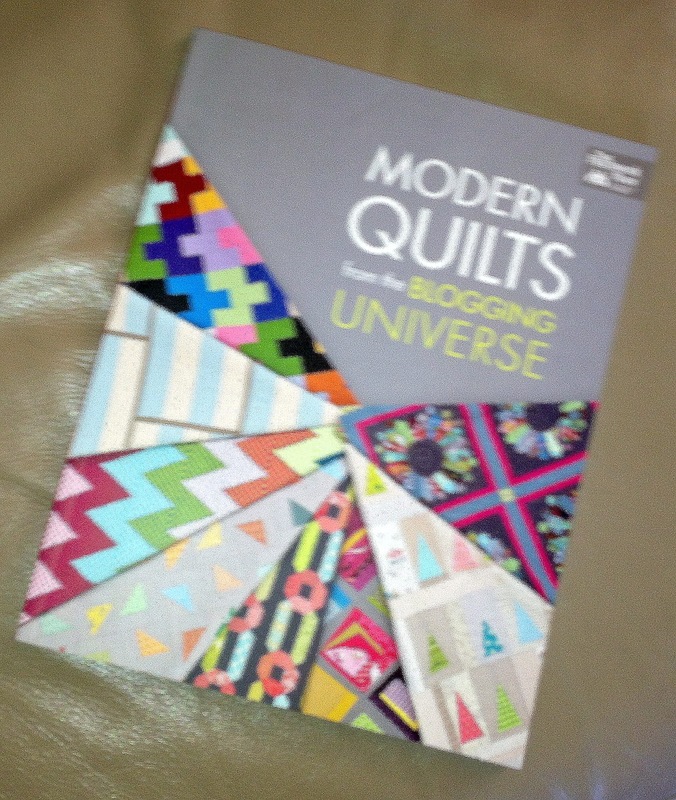 I have shown you before the start of 'my Tree Quilt' from this beautiful book. 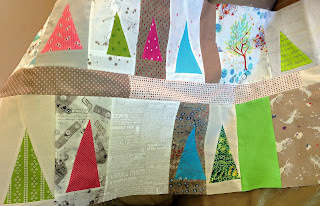 A little progress has happened, but I must tell you I just love this book!!! 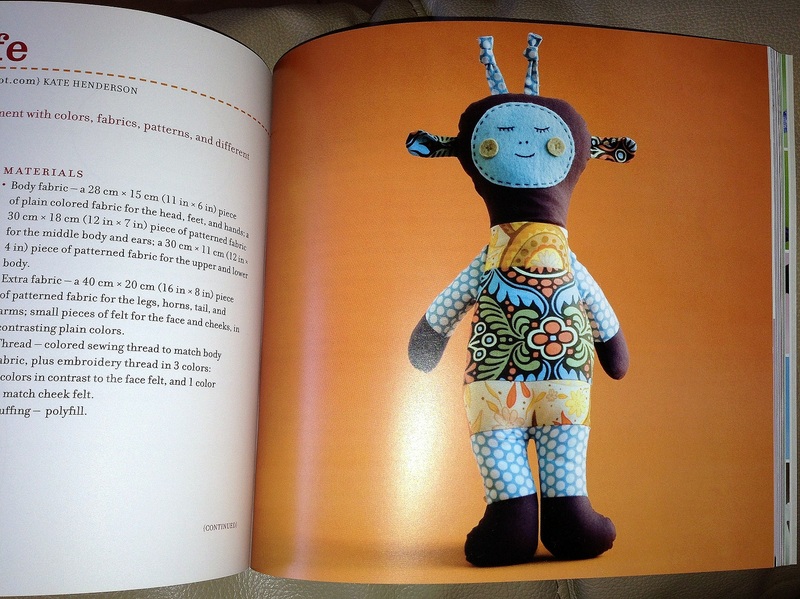 You will hear lot's more of it and our dear Kate from Two Little Banshees has a great pattern featured in it. Now Kate's a Western Australian girl, we are so proud of you Kate, hugs! Now I just have to think how to delete this copy, lol! My beautiful son Aaron and the love of his life, little Oy - they both sort of live in Thailand. We all love Oy like one of our own, she has been in our lives for perhaps 7 years, and now we have a little bub coming mid year. I am absolutely filled with joy and pray God all will go well with the pregnancy! We are off to Thailand Friday next week for a couple of weeks and I'll bore you more about it all thereafter. 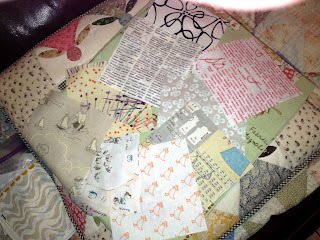 Bad, bad pic again - just a glimpse of fabrics from the latest Low Volume Swap I was in. The postie delivered yesterday and wow! the squares are just sooo great! 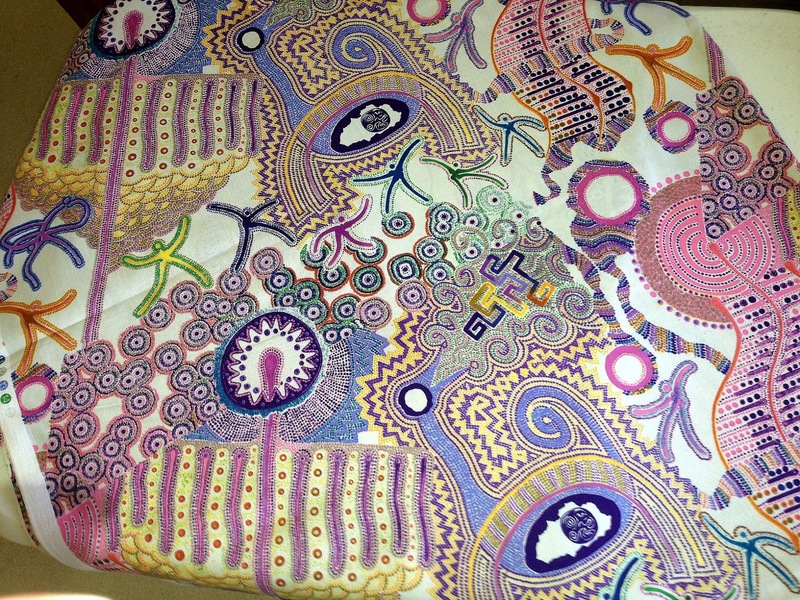 One of my very favourites, and I've already ordered yardage! For now, happy day - I'm off to Perth Modern Quilt Guild tomorrow afternoon - I've newly joined and so far having fun! Will tell you more about it later! I'm out of here while the going is good!!! To talk stitching - lots of WIP and this one is on the design board. 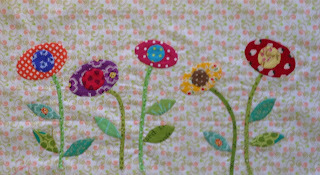 I am just loving it - it is from the beautiful new quilt book Modern Quilts from the Blogging Universe and my first is from Blue Elephant Stitches. 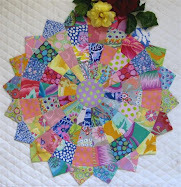 Time permitting, I will show you lots more of what's happening - wouldn't it be nice to post daily! This pic was taken on my new iPhone5 - love it but so much to learn. I have bought a manual so maybe some of it can be stored in my poor wee brain! Oopsy - something happened! Two pics now and I am just going to carry on. 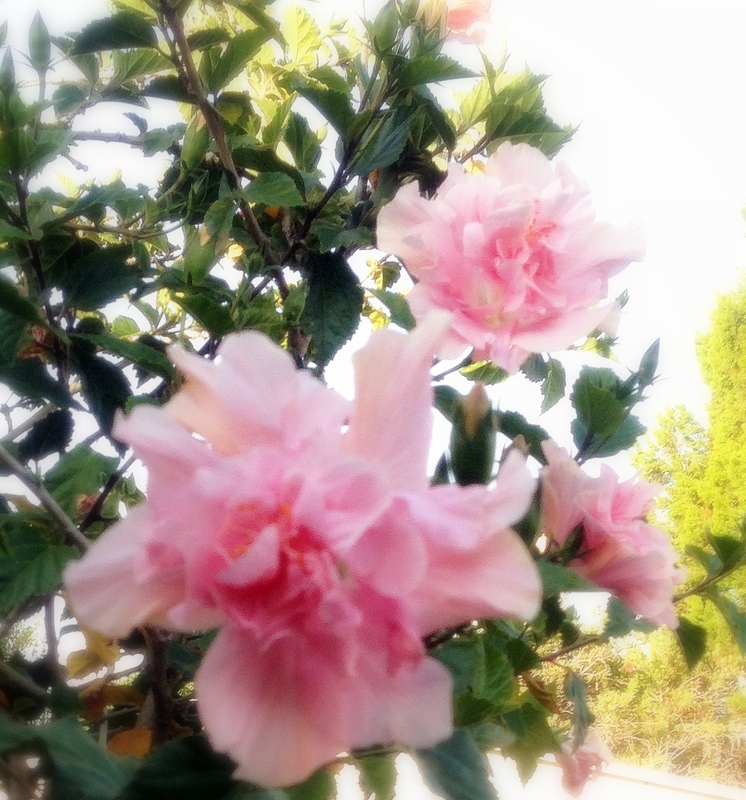 Back to the pic - glorious hibiscus in DD, Danielle's garden and edited in soft focus. 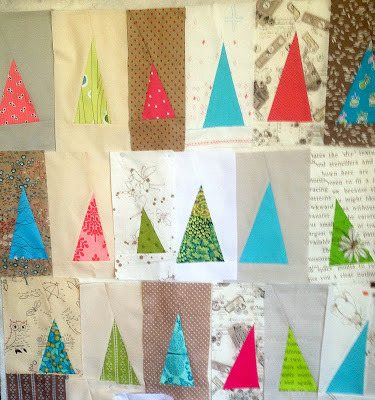 Lovely to be back again with lots of positive thoughts for 2013, stitching this afternoon!